Xbox One X will hit the international market only on November 7 , but the list of games that received exclusive enhancement on Microsoft’s powerful console continues to impress over the course of this semester. After the last image released by filming 72 games that will shoot in 4K HDR as One X sees the light of day at the end of the year, the producer Bethesda surprised this week to confirm that 2 more of their titles also officially embarked on the compilation “Ultra HD “Of the respectable device. The Xbox One X will be able to deliver gorgeous 4K graphics with wide dynamic range for The Evil Within 2 and Wolfenstein II: The New Colossus – which also appear prominently on the list of most anticipated games of the year . Microsoft has also updated the official game pages at the official Xbox store, and both Bethesda titles already show up with enhanced support in One X. This action will enable games to take full advantage of console power Top of the line Xbox family, and the list continues to rise . In addition to the version for Microsoft Windows 10 (PC), Xbox One, the macabre Evil Within 2 will also hit the PlayStation 4 on Friday 13 October . Wolfenstein II will also see the light of day in the same month, but will hit stores on all platforms of the last generation a little later – October 27 . Remembering that Microsoft has confirmed that triple-A games in the Xbox family will still be announced in the coming months, and it looks like we’ll see more of a bunch of great games with enhanced Xbox One X support until the console’s fourth quarter launch – let’s wait . To watch more exciting News and Games please visit our website Techwikies . Technology giants like Amazon, Spotify, Reddit, Facebook, Google, Twitter, and many othersare rallying today in a so-called “day of action” in support of net neutrality, five days ahead of the first deadline for comments on the US Federal Communications Commission’s planned rollback of the rules. In a move that’s equal parts infuriating and exasperating, Ajit Pai, the FCC’s new chairman appointed by President Trump, wants to scrap the open internet protections installed in 2015 under the Obama administration. Those consumer protections mean providers such as AT&T, Charter, Comcast, and Verizon are prevented from blocking or slowing down access to the web. Sites across the web will display alerts on their homepages showing “blocked,” “upgrade,” and “spinning wheel of death” pop-ups to demonstrate what the internet would look like without net neutrality, according to advocacy group Battle for the Net. But most of the pop-ups The Verge has seen have been simple banners or static text with links offering more information. In a blog post on Tuesday, Twitter said that internet service providers are obligated to treat and transmit all bits equally, regardless of origin, content, or destination. It’s encouraging users to use the hashtag #NetNeutrality on its platform. “Net Neutrality is foundational to competitive, free enterprise, entrepreneurial market entry… anyone with a great idea, a unique perspective to share, and a compelling vision can get in the game,” wrote Lauren Culbertson, public policy manager at Twitter. Google also has a blog post up, stating “the net neutrality rules that protect the open internet are in danger of being dismantled.” Unfortunately this message isn’t being delivered via a Google Doodle or on the internet’s most valuable homepage. To learn more about tech see our website TECHWIKIES. Ether, the unit of cryptocurrency used on the Ethereum blockchain, has given investors a wild ride lately. Its value more than doubled in May, peaked in June at more than $400 an ether, and then lost more than half that value by early this week. That may sound like a bubble bursting. But some investors are still optimistic and are prepared to ride it out. Aaron Batalion, a partner at Lightspeed Venture Partners, said he expected to see more 50% price jumps in ether, with big returns down the road. “Over the next five to 10 years, I believe it will be worth 10 or 100 times its current value,” Batalion said. Matt Galligan, a serial entrepreneur and investor in ether, said he was also looking to the five-year mark, when he expects the platform to have matured to the point when it has a lot of uses. 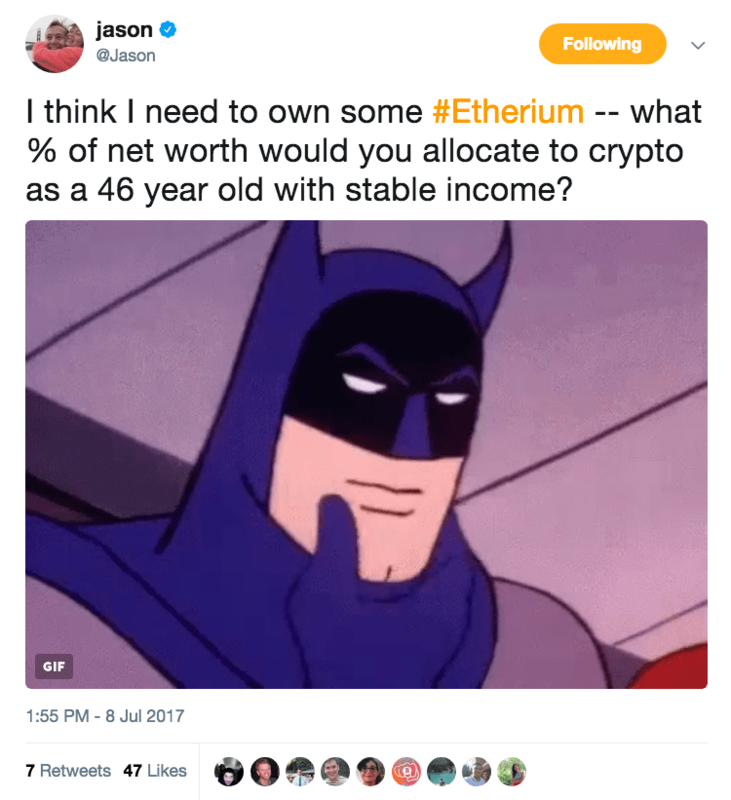 What are Ethereum and ether? Ethereum is a platform for sharing information that cannot be manipulated or changed. It’s a blockchain similar to the one underlying the bitcoin cryptocurrency that records information chronologically and publicly. In the future, Ethereum may be used to securely transfer money to your bank or to send documents to your insurance company. Today, these processes require multiple steps for verification and authentication, but Ethereum makes verification a one-step process because the information is incorruptible in the first place. Ether is the unit of currency in Ethereum. It’s a token that can be exchanged for services on the platform. The currency is the “fuel for the Ethereum virtual machine,” said Andreas Weiler, the head of markets at Smith and Crown, a crypto-financial research group. While often compared to bitcoin, ether is not actually a competing currency. Bitcoin is explicitly a digital form of money and payment system, whereas ether is a means of buying services within Ethereum. Ethereum is still in beta and not widely used, but some investors believe it may someday be a foundational layer of the internet. Ether is still a financial risk, however, because Ethereum hasn’t yet taken off — and there’s no guarantee that it will. “When you invest in ether, you are not actually doing anything — you are holding ammo, which will allow you to execute code when there is code worth being executed on the platform,” Weiler said. In the meantime, though, you have to be prepared for a lot of volatility. The price of ether shot up this spring, rising from less than $20 a digital coin in March to an all-time high of $420 in midday trading in the middle of June, according to Global Digital Asset Exchange, the primary Ether-trading platform. In May alone, it rose to nearly $230 an ether from less than $90. In recent weeks, though, investors have been selling off the digital currency. It sank to as low as $175.56 earlier this week, according to GDAX, before rebounding. In recent trading on Wednesday, it was at $208.87. Part of that instability comes from people not knowing what they’re investing in, Weiler said. “It really did smell like dumb money coming in and not knowing what Ethereum is about or what role ether plays in the economy in the first place,” he said. But the currency’s price may stabilize as Ethereum scales and becomes more commonplace. It is this possibility that is keeping some investors in the game. The money you’ve been using all your life is backed by a government of some sort, and it exists in a tangible way. Bitcoin is neither tangible nor backed by anyone, but it’s still worth a great deal to some people. This digital currency began circulating on the internet in 2009 with each Bitcoin worth just a tiny bit of “real” money, but right now a single Bitcoin is worth more than $2,000. Bitcoin is fascinating from a technological standpoint, but it’s also fueling online crime and violence because of the anonymity it offers. Here’s how Bitcoin works and why you should care. What does Bitcoin mean for the economy? Despite all these issues, Bitcoin is surging in part because more people are using it. Bitcoin fans believe steadfastly that it’s the future. Regular people are becoming interested in crypto-currencies, but it’s still too complicated for mainstream adoption. If that ever happens, we could see a lot more highs and lows in the global economy as Bitcoin’s value swings. And it does… a lot. The value of one Bitcoin over the last few years. Wanna be a millionaire it was easy back then and would have required an investment of just $1,000 i.e. If you’d bought $1,000 of Bitcoin in 2010, you’d be worth $35 million right now. However, if you bought $1,000 worth of Bitcoin in early 2014, you’d have only had a quarter as much buying power a year later. Imagine being paid in Bitcoin, and then finding your money was only worth half as much a few days later. Economies with that kind of inflation are not stable, but Bitcoin has the advantage of operating alongside regular government-backed money. Almost no one has all their assets in Bitcoin. Is Bitcoin going to last? As a backdrop to all this, programmers are arguing over how best to manage Bitcoin going forward. There are calls to “hard fork” the currency, which could lead to two competing standards. That would cause even wilder swings in price. Whatever the long term ramifications of these decisions, Bitcoin (or whatever cryptocurrency it becomes) isn’t going anywhere. According to information obtained by Reuters, Dropbox will be the next service to take a chance on the difficult market of the American stock market. The IPO is expected to launch later this year, the largest technology company in the United States to go public since Snap Inc., the parent company of Snapchat, in March this year. According to the publication, the American company will start collecting investments with banks ‘in the coming weeks’. The news comes after reports that Dropbox secured a $ 600 million credit line in six financial institutions at the end of March; A type of action that linked to an IPO. Rated at nearly $ 10 billion (around $ 32 billion), the company established in 2007 as a free cloud storage has suffered greatly in recent years with the growth of competitors Google Drive and OneDrive, Microsoft. Trying to reinvent itself and remain relevant in the market, Dropbox is currently focused on winning customers in the corporate market by charging a license fee based on the number of employees of the contracting company. Let’s hope that, other than the social network of the ghost, Dropbox succeeds in this onslaught. Apple’s mobile operating system in its iOS 10.3.3 release is already in its fifth round of beta testing since last week, bringing general improvements and bug fixes. Although there is no new feature with this next update, which should officially arrive for everyone within a few weeks, you expect better performance after your installation. So one of the good questions is: does the update make the iPhone faster? In search of an answer, the Mobile Whole has selected some videos that compare side-by-side iOS devices, each with a different version of the system. First, let’s see how the fifth public beta of the iOS 10.3.3 version behaves next to an iOS 10.3.2, both on an iPhone 6S . Although they remain almost the entire synchronized test, version 10.3.2 took a small advantage in the benchmark. Next it was the turn of the iPhone 6 , in which the results were not much more favorable to iOS 10.3.3 beta. It’s time for the iPhone 5S , and now the two versions of the mobile system seem much more tied, except for one or another gag in iOS 10.3.3. Still, AnTuTu shows an advantage for the previous version, but nothing that the user would notice on a daily basis. Finally, with the iPhone 5 , iOS 10.3.3 beta seems slightly faster. The previous version featured some small gagging in this model. Of course, we’re still in a beta version, so Apple is expected to be able to further optimize its operating system before the official release. The Galaxy Note 8, next phablet Samsung’s top of the line anticipated for the second half of this year, has played many leaks in recent months. The device, which had a screen saver leaked a few hours ago, has just leaked into a render that displays what was supposed to be its final design, next to the S-Pen, an accessory that sets it apart from the rest of Samsung’s smartphone line. Curiously, the button dedicated to Bixby does not appear in these images, which makes us question the veracity of this design. The layout on the back brings some similarities with the S8 too, including the position of the biometric reader – very close to the camera, ie fingers on the lenses will be somewhat unavoidable. The difference here is due to the dual-cam sensor, aligned horizontally (different from the vertical we checked in the prototype of Galaxy S8 ). The S-Pen does not seem to have undergone drastic design changes, bringing a format quite similar to that of Galaxy Note 7, which has recently been re-released as Galaxy Note 7 Fan Edition. This device may be announced in August, shortly before the start of the IFA (September 1), and should bring a 6.3 “QHD + Super AMOLED screen, looking like 18: 5: 9, 6 GB RAM, 8877 exynos chips And Snapdragon 835. Xiaomi, who recently announced which of its smartphones would get an upgrade to Android Nougat, may be planning a major release by the end of July. According to a publication made in the Chinese social network Weibo, the manufacturer is expected to launch another smartphone in the series ‘Mi’, and that ‘customers will never guess which model it is’ – which leaves us with ears on the feet of so much curiosity. We have just seen rumors about Redmi Note 5 hardware, but since it is out of the Mi series, we suspect the recent leak of ‘Xiaomi Riva’ on the Geekbench has something to do with this possible announcement. If the rumor is, in fact, real, it might be the second announcement of the company this month, seeing that a few hours ago she released a special version of Xiaomi Mi 6 in honor of Jackie Chan . The company is currently working on the next version of its system, MIUI 9, which is expected to hit the market with several interesting new features; She even opened a poll to know which smartphone model should be upgraded first. It would be good if the new model already brought the pre-installed MIUI 9 from the factory, right? History repeats itself; Once again, a protective cover of the Xiaomi Mi 6 Plus has just been leaked on the web, just like the one that appeared about a month ago, reviving rumors about the arrival of the phablet to the market. The Mi 6 Plus, which has also had its alleged back poured in June, is expected since April when the Chinese manufacturer officialized the Mi 6, its current top of the line. After rumors that the ‘Plus’ series had been discontinued in favor of a greater focus on Mi Note 3, week after week we have seen that the firm may not actually have completely discarded this product. In fact, it would be a great addition to the line of Xiaomi devices, after all, not everyone is satisfied with the size of the screen of the Mi 6, which has 5.15 “, something behind the sea of flagships with screens of 5, 5 “or more. Another detail is the possibility of an option with QHD resolution, something that would also satisfy users more demanding in terms of image quality. With recent rumors that Xiaomi can launch a device for the ‘Mi’ series by the end of July, is it possible that we are talking about the Mi 6 Plus, is not it? We now only have to wait and see! An internal Samsung document has virtually confirmed the presence of two main cameras in the Galaxy Note 8, but new information arrived on Wednesday, July 5, with a trio of functions that promise to displace until the Galaxy S8. Under the name ISOCELL Dual, the sensor includes Zoom, LLS (Low Light Shooting) and Dual Sensing. The union of the three factors allows the captured images to have a high quality, no matter the environment or the distance of the landscape, see below. Zoom – with the suggestive name, it is the optical zoom, when there is the physical movement of the sensor in the approximation of the image, instead of cutting by digital means. It is believed that the Galaxy Note 8 will have optical zoom up to 3 times. LLS (Low Light Shooting) – with a larger aperture, the ISOCELL Dual sensor would use the RGB + monochrome system to achieve impressive results in low light environments; Noise reduction is one of its strengths. Depth Sensing – also on account of using two sensors, Galaxy Note 8 would be able to better identify what needs to be highlighted in the image, making the bokeh effect to focus only on what matters. If the Galaxy S8 camera already has undoubted quality, expect an even more advanced advance in the Galaxy Note 8 sensors. It, on the other hand, will not be Samsung’s first dual-cam as it is expected that the Galaxy C10 arrive sooner. Legend has it that Samsung marked a special event for August 26, next month, to announce the Galaxy Note 8 to the public. This would cause her to get ahead of the debut of the new iPhone, which should happen next.